The ultimate guide to Val Thorens ski holidays. 2300m at the top of the Three Valleys, VT is the highest ski resort in Europe and part of the biggest linked ski area on the planet. While it’s a place for people who above all else, love to ski, you’ll also find some of the country’s best après including the legendary Folie Douce, as well as weird and wonderful activities like the 1300m Tyrolienne zipwire. 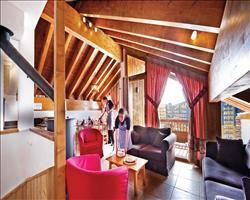 Accommodation ranges from cheap apartments to chalets and high end hotels, mostly housed in a cluster of wood-clad multi-story buildings around Place Caron, on the mountainside. The purpose-built nature of the resort also means easy access between the lodgings and the much loved restaurants, bars, shops and leisure centre, via safe, semi-pedestrianised streets. This was one of the first resorts to provide free Wi-Fi in its' lift system, letting you share skiing updates and photos of the spectacular scenery with the poor souls back in Blighty. Over 30 speedy lifts serve the 150km of runs in the local area. While this is more than adequate for beginners and early intermediates, it's the perfectly seamless lift-linked nature of the wider 3 Valleys that draws most people to this resort - the whole area pass leaves you free to roam 600km of terrain, covering 7 other resorts including titans Meribel and Courchevel, plus the pretty and more intimate resorts of La Tania and Brides les Bains. View our detailed Val Thorens snow forecast or snow report and see all live webcams, piste maps, road and travel maps and lift pass prices. For a picture of historic snow conditions see the snow depths month by month with our Val Thorens snow history. At the summit of the largest ski area in the world and bordering the Vanoise National Park, this is a spectacular place to ski and board. Beginners are well catered for on nursery slopes by the Rond Point des Pistes, where the magic carpets often don't require a lift pass. Kids will love the Junior Park, while the Musaraigne and Campagnols runs in the beginner’s area and the new Deux Combes green are perfect to practice on. With a bit more confidence, take the Pionniers or Plein Sud chairs for some lovely long blues back down to resort. For a lovely bit of cruising, head down to the Belleville Valley via the Boulevard Cumin run. Intermediates will find fantastic red runs all over the area, including a few great descents from the Péclet and a fantastic trail between the Chaviere and Thorens glaciers, while the north-facing 3km Caron run and the Combe Rosael are two must-ski steeps for experts. The reds, blues and aforementioned Combe Rosael black around Orelle or the ‘fourth valley’ tend to be delightfully quiet, with most skiers heading in the opposite direction towards Meribel. On a good snow day, the off piste is unbelievable, particularly around the Vallon du Lou and from the Cime du Caron. Pierre Lory towards Orelle is fairly forgiving if you’ve only been off piste a few times – hire a mountain guide to lead you around or go all out with a heli-drop. Freestylers from around the 3 valleys visit the awesome 70,000m2 Snowpark here, which has areas specifically designated for different abilities with jumps, rails and boxes of all shapes and sizes, as well as a Jump Airbag to develop your skills. The après ski here easily rivals other top resorts in the Alps. If you haven't already had the Folie Douce experience, head just under the Plein Sud lifts where the “dancefloor on top of the world” is heaving from 3pm. Another place to party is Bar 360 at the end of the blue Moraine run, which always has live music and cheaper plonk. Back in town, Rue de Gebroulaz is a hub of lively bars where O’Connells is the local Irish pub and the Frog and Roastbeef is a long-time favourite of Brits (if you can drink their Yard of Ale in one, you don’t have to pay for it...). L’Eclipse on Galerie Caron has wifi, a big screen and live music in the evenings, or for a chilled out hot choc or beer, Le Rendez Vous is perfect. Head to Place Caron where you’ll find Le Blanchot which is a small wine bar and restaurant and Malaysia (the biggest night club in the Alps) for some late night partying. When it comes to hungry stomachs, Burger Bar and the Steak Club both do what they say on the tin (and jolly well too) and La Pause is lovely an authentic. 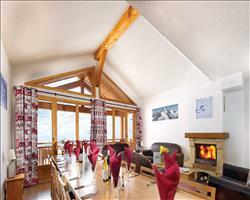 Chalet de la Marine has a self service restaurant as well as a traditional gourmet restaurant and they usually do a torchlight descent evening every Wednesday which is good fun. For something really special, book a table in Oxalys for some Michelin star dining accompanied by amazing views of the mountains. Whether you're a non-skier or just fancy a change of activity, there's a wide range of things to do both indoors and out. On the snow, the longest toboggan run in Europe is worth checking out for 45 minutes of whooping-good fun and snow-mountain-biking is becoming increasingly popular. Snowshoeing, night hikes, paragliding and glacier tours also offer an alternative experience of the mountainside. The Tyrolienne and Bee ziplines (the latter's a double zipline so you can do it in pairs) zoom through the air at bonkers speeds for the ultimate adrenaline hit. If you've had your fill of the outdoors, there are plenty of indoor sporting facilities including a swimming pool, squash and volleyball courts and a gym. There is also a cinema, bowling alley and amusement arcade, or for that well-deserved pamper-session, a jacuzzi, sauna and various spa treatments are available. Children are catered for brilliantly, with a children's sledging area, huge Fun Park with bouncy castles, ball pools and trampolines and fun activities at the sport centre's Aquaclub. When is the best time to ski Val Thorens? Val Thorens' ski season begins in November and, with nearly all slopes well above 2000m altitude, the lifts tend to stay open through to May. With a bevy of mainly north-facing slopes facing N, NE, NW, S, you can plan your route to ride in the sun all day, and avoid icy/slushy slopes depending on the time of year you travel. With an average snowfall of 2 metres, Val Thorens is the most snow-sure resort in the Three Valleys, and in case any pistes are lacking, over 350 snow cannons ensure 40% of the overall piste can be maintained by man, if the snow Gods ever let us down. Confident in their well-conditioned pistes, the tourist office’s ‘Snow Guarantee' challenges you to find another resort in Europe with better conditions. Pack an extra layer if you're travelling between December and February as it can get quite nippy when you're so high up. For the optimum goggle-tan, come later on in the season for long cruisey days. There's no better place for T-shirt skiing in March and April and Val Thorens is our favourite spot for an Easter ski trip. Browse all Val Thorens ski deals or read about holidays in December, January, February, March or April. Some of the best family accommodation provides easy access to the ski school meeting points – this includes Hotel le Val Thorens if you’re looking for a family friendly hotel and Village Montana Apartments if you’re after an apartment. 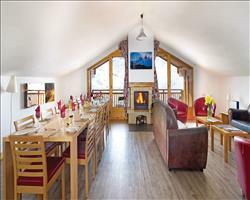 Chalet Elaine is also nearby and offers a more traditional setting, sleeping a party of 6-7. As a resort, Val Thorens caters excellently for families – the ski area offers something for everyone and there are some brilliant off-slope activities where you can enjoy quality family time. Children will love the activities at the sports centre as well as the impressive Fun Park. 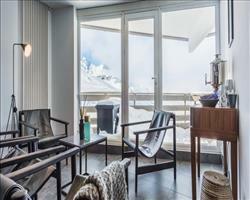 With a range of hotels, apartments and chalets in Val Thorens, you’re sure to find something to suit your brood. Our hotels are a brilliant choice for family holidays and many offer childcare, babysitting and kids clubs – choose between B&B, half board and all inclusive options. Self catering apartments can be a brilliant choice for a cheap family holiday – cook easy family favourites in the evening and enjoy quality time in your own space. We love the cosy, intimate feel of our ski chalets – book one that matches your group size to enjoy sole occupancy or opt for a big chalet where children can make friends while parents enjoy other adult company. See our best family accommodation below to find something that suits you. Opt for flights and transfers for a hassle-free journey or select self-drive or accommodation only instead of flights. Our ski specialists know everything that makes a family ski holiday special – get in touch for expert help and advice. Small groups looking for a cheap ski deal that don’t mind self catering should consider the Altineige Apartments which offer excellent access to the slopes and attractions. If you’re a group of 8-10, book everyone into somewhere like Chalet Chloe, which offers ski in-ski out convenience. Chalet Catherine is a popular detached chalet that’s ideal for larger groups up to 18. It boasts a central location on the nursery slopes which makes it perfect if you’re travelling with beginners. Our ski hotels are a brilliant option where everyone can have their own rooms and enjoy large communal dining and lounge areas. Two popular hotels are Hotel Le Val Chavière which is ski in-ski out and Hotel Le Sherpa which offers brilliant access to both the slopes and nightlife. 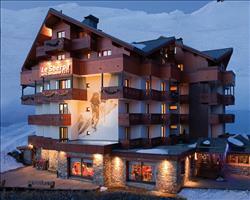 In terms of the resort itself, Val Thorens is a super group holiday location. All levels of skier and snowboarder are spoilt for choice in the local area – even more so with the 3 Valleys pass which lets you loose on a whopping 600km ski area! Any non-skiers tagging along are equally well provided for with a long list of indoor and outdoor activities. Groups looking to party should look no further – the Folie Douce and Dicks Tea Bar are two legends of the ski world offering some of the best après in the 3 Valleys. Planning a holiday for a group can seem difficult – but with our group deals, accommodation and expert advice, booking a group holiday with SNO couldn’t be easier. The skiing is second to none and I’d highly recommend it! We skied the whole 3 Valleys area and it was brilliant with loads of good snow. Whether you get the whole area pass or not depends on what kind of skier you are; if you’re a beginner or like skiing the same area all week, just the Val Thorens pass would be good but if you like exploring blacks and off piste, it’s best to get the pass for the whole area. The top part of Courchevel is really nice – from the very top of the gondola there are some really good blacks, off piste and moguls which we loved. If you go into the fourth valley – Orelle - there are some really nice long blacks you can do. A useful tip is do not leave Val Thorens if the weather is bad... If we’d had known it was best to stay in Val Thorens, we’d never have gone out. We found out the hard way when we skied over to Meribel and they closed the lifts, the bus back was horrendous with people piling on and skis flung all over the place. We had to pay for the bus, so it’s worth having money with you in case you get stuck. The only drawback to the resort is that the eating out is really expensive - we were stung on the first day and ended up paying 12€ for a hot chocolate! There are some really nice restaurants but they aren’t cheap and we only ate out 2 or 3 times. It depends what you go for and want to do, but we had a kid and weren’t planning on going out and getting drunk... We ended up packing chocolate bars and making our own sandwiches to have at lunch time. I would highly recommend families with older kids doing the night time toboggan run. It costs around 20€ and they give you a little headlamp which you can keep. When you're going up, it’s just getting dark at 5:30-6pm, and then on the way down it’s pitch black! The whole thing is a long one hour run and you have glühwein at the end. It was really good fun and something we will always remember, so I’d definitely recommend it! The toboggan run is also open in the daytime which might be better for families with younger children. I don’t think I’ve been anywhere better! Val T has a significantly larger number of lifts and pistes than other resorts say in Italy and the number of pistes that are skiable at any one time is great. A lot of resorts are just north facing but Val T has a lot in all directions so you don’t always have to ski in darkness and can ski in some sunshine which is nice! The ski area is more for intermediates and better skiers, there were some nursery areas but I probably wouldn’t go there if I was starting off. There’s a gorgeous area called the “Hidden Valley” or “Fourth Valley” up over the back where there are some really lovely runs that are much less crowded - I would definitely recommend the area, you’ve got a couple of reds, blacks and a blue to choose between. We went out a few evenings and the nightlife is ok, quite student club like. The town felt very much like an artificial town built around a ski resort rather than a town that just happens to have ski slopes near it like you have in Meribel. It’s reasonably expensive buying food and kit and stuff but that’s what you expect in the Three Valleys! The Folie Douce is pretty awesome, it’s one of the big clubs up on the mountain which you ski into and ski down from and I’d definitely recommend checking it out. We had an amazing holiday! I loved Val Thorens it’s a fantastic resort and we were really lucky to have 6 days of blue skies all day long. Obviously there’s a huge amount of runs and in the town there’s a good mix of restaurants and bars. I’ve been on ski holidays before where there wasn’t much going on in the town but it wasn’t like that here. Our whole group had something to suit them, my parents could find things to do while we went out and did our own thing. Go to Malaysia for a night out and places like Folie Douce were also really good. Loads of people in our chalet did the tobogganing which they said was amazing so I’d recommend having a go at that. We stuck around the Val Thorens area as one of the group was a beginner but we want to go back and do more of the 3 Valleys next time. Another thing I’d recommend is doing a 1:1 lesson, mine was with Prosneige and I did a bit of off-piste – definitely get a guide to take you off piste if you can. "Malaysia's the best club, don't leave it to the last night!" Had a really good week. Only problem was that we found the best club on the last night! Everyone we spoke to said Malaysia was alright but expensive and that other places were better… all the seasonaires go to Summit bar which was pretty rammed and rubbish and the Frog was pretty rubbish too. We ended up staying in for 2 nights before we gave Malaysia a go which turned out to be wicked. The best bars seemed to be the hotel bars even though you ended up spending a bit more money and there was another Irish bar which was good. We thought it would take ages to ski to the other end of the 3 Valleys from here but we managed to make it to Courchevel in about 2 and a half hours so we got to spend a good couple of hours in the park over there (we actually went back the next day as it was better than the one in VT). We did one evening with an all you can eat meal on the mountains and then a ski back down with torches. The food was really good and you really could eat all you wanted, they didn’t stop us! The only bad thing was that we had to walk back. This is a great resort, the skiing is very good, pretty good for beginners although slightly limited (we ended up skiing the same few runs with our 5 year old at the start) but if you’re better at skiing, you can go further afield. It’s almost enough skiing to last you the whole week in the local area, rather than getting the whole 3 Valleys pass, some friends we skied with only had the Val Thorens pass and seemed more than happy. We didn’t use ESF ski school but booked lessons with a local company called Prosneige who were excellent. When you’re looking for accommodation in Val Thorens, the closer to the slopes the better as it’s easier to get out and back. If you end up staying at the top of the resort, it’s quite far away. It’s also a little noisy in the town centre around the main square and Place de Caron, so it’s worth staying a bit further back if you don’t want to be bothered by the nightlife. We stayed here after half term and although there were definitely people there, the resort wasn’t at its maximum limit and there were only a few places with queues. I’ve been to Meribel and Courchevel for half term before and they’re really packed, but Val Thorens didn’t feel anywhere near as busy. There were less Brits by a long way and more French and German families, whereas places like Meribel are filled with Brits. In terms of which lifts to avoid: if you’re skiing over to Meribel on the first lift, the second lift you get usually has a bit of a queue as it opens later than the first. Also the 2 or 3 lifts down from where the ski schools meet tend to be busy around 9:15 as they’re being used by the classes. If you ski from the lifts further down, you don’t have to wait at all. "The best ski area in the world"
We’re very experienced skiers and have skied the 3 Valleys a lot (used to stay in Courchevel but it’s too expensive now) – it’s probably the best ski area in the world. Val Thorens couldn’t be better – it’s a great skiing resort and the area has a tremendous variety of uplift and degrees of difficulty of slopes. It has something for all levels of skier and snowboarder and for boarders there are boarding areas with jumps and half pipes etc if you want them. "Miles and miles of incredible skiing"
The weather was a bit rough as we had a lot of low cloud but we also had some huge ski days which were absolutely gorgeous. I like the resort as a whole – it’s fairly compact, but the big bonus is the fact that you’ve got such a big ski area available so you don’t need to ski the same run on 2 days. There are some lovely mountain descents where you go all the way from top to bottom. You can go all the way up high or down to the lower slopes, depending on what you like and since we’ve been there for the past 2-3 years, they’ve added some new high speed chair lifts. My advice to anyone going here is to get the full lift pass and spend a day going right up the top and over to Courchevel and Meribel. There are some really lovely long runs and you’ll find a great restaurant for lunch just by the little airfield in Courchevel – it actually has a jewellers in the restaurant where you’ll see some huge diamonds but the best thing to do is grab your food and eat outside if there’s nice weather. Stayed here in April and had excellent weather, I had never done a spring ski trip before and was actually surprised how good the conditions were. It was only really from 3 o’clock onwards that slopes started getting slushy. I would definitely recommend VT – as a party and skiing destination it’s quite well balanced and if you like après it’s probably one of the best places. I would recommend seeking out Bar 360 – Folie Douce is the one most people go to but 360 is just as good when it comes to atmosphere, plus it’s less busy and cheaper too. I’d also suggest not going to Courchevel for lunch unless you want to pay three times the price! If you’re a mid-level to advanced skier the area is really good. There are a few green slopes in the centre of town but for learners it’s probably not the best. 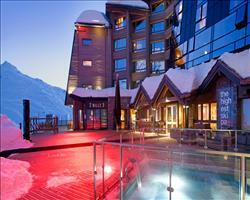 "Great resort - eat, drink & ski"
Val Thorens isn’t like the Tignes’, Val d’Isere’s and Zermatt’s of this world. It’s first and foremost a ski resort and if you’re not eating or drinking, you’re skiing. If someone was looking for fine food restaurants and things like that, I’d suggest Zermatt or Verbier instead. If you want good enough accommodation, nice enough restaurants and lots of skiing however, I’d strongly recommend Val Thorens. We had an absolutely amazing week and really enjoyed it here. There was hardly any snow at the beginning of the season and Meribel and Courchevel were closed, so we ended up having 5000 people coming up to Val Thorens, which actually had good enough snow for the time of year. Other than ski, we went to our tour provider’s barbeque at a good restaurant called 360 and also did a quiz night and ice skating which were fun. There’s a leisure centre right in the middle of town with things like bowling but we didn’t make it over there. Also didn’t get round to doing the ski-dos, but a couple of our friends who did had a great day out. We had a very good week and the weather was superb which makes all the difference! We’d been to Val Thorens a couple of times before and part of the reason we returned was because it’s high and snow sure. We’ve always gone for the full 3 Valleys pass but this was the first time we actually used it, there’s a lot to ski in Val Thorens alone! We went over to Meribel and Courchevel which was good. One thing I would definitely recommend doing is the tobogganing – you take a gondola to the top and there’s a pisted 6 kilometre run all the way down, great fun! Val Thorens is up with the best of them! It has a glacier and is nice and high. It wouldn’t be in my first list of resorts for beginner skiers - the nursery slopes are right near the centre of the resort, and that’s where everyone skis in to get back. This caused a bit of chaos especially when some of the ski schools were going on. The area is good for keeping intermediate skiers interested and it is a great place for advanced skiers. Val Thorens is a really excellent resort for kids. We had a lot of cloud in the Easter holidays, but the snow was fantastic and we were skiing every day. The kids had good lessons with an older French lady who was a pretty hard task master – generally they were happy with the private group lesson and really got a lot out of it; she had them parallel skiing by the end of the week. There are a few other things to do around the resort, but we just tended to get out in the morning and have the whole day ahead of us to ski. We went out for a couple of meals but didn’t do the bowling or anything like that. Weather was windy to start with which wasn’t ideal if you wanted to ski to other areas, but by Wednesday it was fine. The ski area is high, so you’re going to be on the best snow in the region. It’s well connected so there’s lots of other stuff. I even went down to Les Menuires at that time of year which is usually slushy. The good thing about having such a big area is that you can pick where to ski depending on what’s going to be sunny/slushy and when. Also it’s so big that everyone’s catered for. There are some places where advanced skiers might get bored after a while, but this isn't one of them! Val Thorens is a really nice resort, after having a week of slush in Saalbach the same time last year, we had a nice balance between cold and sunny. We had the whole 3 Valleys pass so could ski between the resorts. We went to Folie Douce on the top of the slopes a couple of times which is good, and a girl we shared our chalet with who’d done a season in VT took us to a really nice place called Bar 360 on the other side of the resort, which I’d definitely recommend trying out. "Good skiing, but think Courchevel is more suited to us"
All of us – my wife and I are in our early 60’s, my daughter and her husband in their 30’s – said that we probably wouldn’t go back to Val Thorens. The town was a little bigger than we’re used to having in Tignes and Flaine, and seemed to be a place where groups of people came to drink and make noise all night. If we returned I’d stay at the Koh I Nor again, as it’s a bit up and away from the centre. The weather was excellent, with blue skies all week. And for anyone going for the skiing, there’s a huge variety in terms of the space and number of areas. If you’re keen on skiing and getting about, the 3 Valleys pass is brilliant. We took some time and went over to Meribel and Courchevel. Though the skiing around Val Thorens is good, I think we’d choose to stay in Courchevel if we returned to the 3 Valleys. It has such undulating terrain with wide open spaces you don’t find elsewhere. The town itself is split into 2 areas, so from a size point of view I think it would suit us well too. Enjoyed Val Thorens, it’s a fun place to ski. It’s definitely more for a younger crowd of 20-30 year olds - the nightlife is quite good and there are lots of bars and cheap pizza places. It’s not too swanky and there’s a lot of cheap accommodation if you’re looking for a deal. We had a wicked week and will definitely go back to VT. It’s a lively resort with lots to do and the snow is great as it’s so high – I reckon the best time to ski would be March as you’d get clearer skies and more sunshine. We were 2 snowboarders and 2 skiers, all intermediate level and the area was perfect for us. Our favourite bar was Le Monde – it’s a small place but had good music and friendly staff. There was also a good Irish bar - every resort has to have an Irish bar which is always good for football etc! Overall a great week all round. "A lot of skiing - most need only local pass"
There is a lot of skiing and I think it has the most out of all the Three Valleys resorts, the ticket office try to sell you the entire area pass but you don’t really need it unless you’re a very good skier. It’s high altitude so you have amazing scenery but there are no trees so you don’t have as much variety of landscape as you’d have elsewhere. Val Thorens isn’t good for beginners, there are much fewer greens, the learning areas are basic and the beginner slopes are quite busy as they’re near the hub of the resort. However if you’re competent on reds and blues the area is absolutely fine. 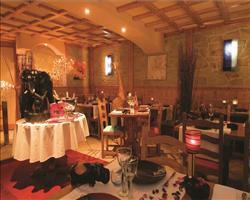 Family-wise, Val Thorens has lots of good eating out places and the leisure centre is quite good for kids. The ski area caters well to all levels. Thought Val Thorens was brilliant and would definitely go back. We had the full Three Valleys passes and went across to Meribel which was good. Weather wise, according to people in the resort we had the best week of the season so far in the middle of March, apart from one white out day it was sunny all week – we all came back burned! "April 2016 in Val Thorens"
We had really good snow and a fantastic week in Val Thorens. We’d skied here before but not stayed here and it was good – we pretty much skied and slept and that was it! In terms of what ski levels it’s best for, I think it’s pretty good all round. We skied here in April and the snow was fantastic. You need to be a bit more experienced to really enjoy the ski area – the slopes here are harder than you get in Courchevel, but as a family we had a really good time. I worked in Val Thorens as a rep for a couple of years and it’s by far my favourite resort in the Alps. You get a little bit of everything: the ski area is great, the village is all on one level and there’s lots going on. "A full range of skiing, good for beginners"
It was my first time in Val Thorens. I found it a bit confusing navigation-wise but that is probably because it was a new place for me (I usually go to Les Arcs/Morzine) and there was a white out for the first few days. We would definitely go back. The skiing was great, as were the snow conditions. There’s a full range of skiing there. I’m not the most confident skier and it was good for me, it’s a good place for beginners and intermediates. It would also suit families with children. I had lessons which I booked through my hotel with the local French school, they were very good. We went to a few of the mountain restaurants while we were there, it’s renowned for being expensive but I didn’t think it was particularly, not compared to other resorts. We travelled by Eurostar to get to Val Thorens, I find it an easy and more relaxing way to travel. The transfer from the station was a bit longer than to Les Arcs. This was our 4th or 5th year in a row going to Val Thorens. It’s a massive ski area and all easily accessible. Our children like the nightlife and there are some good restaurants. We were a group of intermediate and advanced skiers, but the resort caters for every level. We could ski on the same mountain as the rest of the group, so while they went down a black we were able to ski down the easier runs and then meet up again at the bottom. "The 3 Valleys is a great area"
Loved Val Thorens! When we arrived the snow was fantastic. Have been to Meribel plenty of times and the 3 Valleys area is great for all levels (though Val d’Isere is still my favourite). This is a really great resort, I’ve been here several times. It’s very high up so there’s lots of snow all around. We had the flu last time we went and I think the altitude made us feel worse. I would definitely go back to this resort, it’s great. It must be the best European resort we’ve stayed in and we’ve been to resorts all over. We brought non-skiers with us and there was plenty for them to do, lots of shops and restaurants and cafes. It’s good for families as well, there were lots of play parks for children and there’s a swimming pool and a sledging area. The skiing was amazing! It’s an all-round great resort. 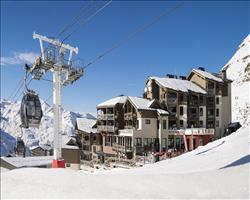 "Beautiful resort, good beginner skiing"
I really liked Val Thorens; it’s a beautiful place. I would definitely recommend it to beginners as there’s such an array of ski slopes. They’re quite wide so you feel safe (I skied in Chamonix previously where it felt too close to the edge). We ate out every day and lunches were very reasonable, as was ski hire. We had good weather too! "Lots of snowboarding in VT"
With the whole Three Valleys pass, Val Thorens has such a big area. I would definitely recommend it to other snowboarders. As a single traveller I was able to snowboard all week with other boarders who I hadn’t met before, there’s a really good social scene here. Visibility wasn’t great at the end of March, but it wasn’t so bad that I couldn’t enjoy the slopes! Val Thorens is a really good resort but there are a lot of university students so it can get quite noisy at night. I had no trouble sleeping but others I stayed with complained about the noise. Good skiing, good area and you’re never stuck for choice of where to find good food. We were 3 snowboarders and there was plenty for us on the mountain. We were really lucky that there was heavy snow before we arrived and it snowed in the nights while we were here. "Brilliant slopes, prefer Val d'Isere's town"
Val Thorens is pretty good; the town is a little groggy compared to Val d’Isere where we went last year, but the actual slopes are brilliant. We would probably go back, but at the moment we want to try other resorts to see what they’re like. 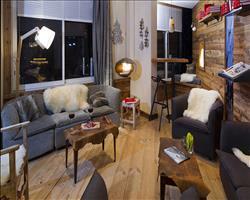 "Good bars, restaurants and a big ski area"
First time in Val Thorens, it’s a good resort! The area isn’t great for snowboarders as there are quite a lot of flat bits, but it’s good that it links up to other places. The town’s nice with lots of bars and restaurants. We were caught on the train that got delayed which was kind of chaotic – standing on a platform in France for an hour with 4-5 trains worth of people and only 3 staff trying to sort it out - but we got really good compensation from the train company which more than made up for it! Loved our week in Val Thorens! It has a good atmosphere, nice slopes and everything’s easily accessible. We got stuck in Geneva for a day due to snowstorm so missed a day of skiing, but it did mean we had brilliant conditions on the slopes when we arrived. We’ll definitely be back! "Love it - been a number of times"
It’s a really big resort and the slopes are high. It’s a bit studenty which some people don’t like, but I love it. Val Thorens was probably too busy for us on the New Year’s week – we went straight to Verbier afterwards and definitely preferred it. They did do a party for New Year’s Eve but we had some friends in another hotel and hooked up with them. I’d highly recommend the 2km sledge ride in the night time which was really good fun. "Good week, somewhere more central would be better"
It was our first time staying in Val Thorens and I don’t think we’d go back to the same resort, I’d probably choose somewhere in one of the other valleys that’s more central. There was definitely enough skiing for a week, we’re intermediates and it would be fine for other people of the same level – I’d say anyone from a beginner upwards could enjoy it. There’s a terrain park as well in one of the other valleys but we didn’t go there. We skied / snowboarded at the beginning of January – the snow conditions were fairly decent and there was a good downpour before we arrived. "5/5 huge ski area, 4/5 not bad apres"
We were a mixed group of 18 and the area had a good mixture of terrain for us all – the 3 Valleys is the largest ski area in the world so there’s loads to explore. The nightlife isn’t as good as places like Val d’Isere but there are a few good pubs and bars. "Can ski back to door nearly everywhere!" 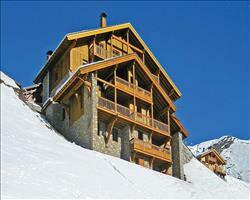 Usually stay in Meribel but this is a nice place to ski the Val Thorens, Les Menuires areas. This would be a lovely resort to take the kids, you can ski back to the door nearly everywhere. It's a really good place for a budget ski holiday, as there are loads of apartments and the supermarkets seemed to be quite cheap too if you're planning to go self catering. Hadn’t been to Val Thorens before but we were very pleased with it. I liked everything in terms of the location and accessibility to other parts of the 3 Valleys. 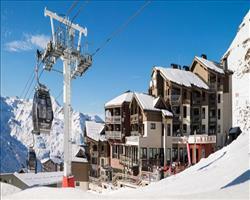 The fact that you can go further afield and ski around Meribel and Courchevel is great. The snow and ski conditions were excellent and you’ve got the full range of slopes for different levels of skiers. "VT - not a tranquil resort"
Val Thorens is perfect for good skiers who want to ski until they drop. It has good access to the slopes, but as a resort I didn’t like it. If you want something tranquil this isn’t the place, it’s consumer heaven for people who want to eat fast food, ski and drink. It all seemed a bit disrespectful to the mountains. It took us 5 hours to get there from Grenoble because it was busy, and the resort was busy on half term week. Val Thorens, whilst it’s the highest resort Europe it, it’s linked up to the largest ski area in the world! Its altitude almost guarantees great snow every season, with slopes that can literally cater for all level of skiers and boarders. The resort itself is a lively one; Bar 360 and La Follie Douche are great slope side fun and its home to the largest night club in the Alps, Malaysia, with plenty of other bars to visit before! 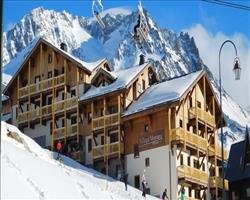 A lot of the accommodation here is ski in / ski out or at very least close to the slopes! A great ski holiday for the more experienced skier who likes to enjoy a spot of après in the evening! "VT is excellent for all abilities/ages"
Val Thorens is excellent, there’s such an expanse of skiing and plenty of evening activities too. It’s good for all types, even groups of differing ages as there’s something for everyone. "Snowsure and great for mixed ability groups"
Highly recommended for anyone wanting snow-sure conditions. Terrific for groups of mixed ability, as the huge amount of terrain means there’s miles of piste for everyone. Anyone who prefers exciting nightlife will love the lively après ski in VT (they even have their own Folie Douce, but my favourite is the brilliantly titled pub Le Frog and Rosbeef which is informal and really friendly - Brit run). It’s one of the best purpose build French ski resorts in the alps – not chocolate box charming but high-end and high altitude enough to make a great base for skiing or snowboarding at any time during the season. 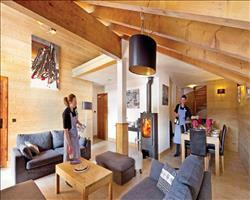 "Lovely catered chalets + super cheap slopeside self catering"
Really great for advanced skiers and snowboarders. There are lots of lovely catered chalets and ski in/ski out hotels in Val Thorens, but the resort also really stands out for self-catering apartments, which are booked time and again by families and groups who want to ski one of the world’s greatest ski areas on a budget. How do I know that? I used to work in the UK helping to find families great value ski holidays with Sno... so I'm a bit biased but do know what I'm on a about! "Look for doorstep skiing, not hot tubs and pools"
La folie douce was probably the highlight of our holiday with incredible après ski right there on the piste. The skiing in the 3 Valleys is incredible and Val Thorens has the highest point in that area. When booking we found there are plenty of places to stay that are ski in and ski out, so make sure you have a look at that, because its one thing that can really make your holiday amazing (much more important than hot tubs or swimming pool kind of facilities – after all, you’re here to ski!). The town is brilliant as well, so good in fact that I fell asleep in “Malaysia”, the big local nightclub. I feel I should clarify, I’m not being sarcastic…..I just had a few too many shandies!